An article published in the journal “Nature” describes the discovery of a pulsar-type neutron star with a very strong magnetic field that emits a jet of materials. A team of researchers used the Very Large Array (VLA) radio telescope to study the neutron star cataloged as Swift J0243.6+6124 and simply called Sw J0243 discovering an anomaly because according to the formation models for jets of material a pulsar with such a strong magnetic field shouldn’t be able to emit them. A neutron star is a possible outcome to what remains of the core of a massive star exploded in a supernova. Extremely concentrated, it has a very strong gravity and if it’s part of a binary system it can steal gas from its companion. That gas forms an accretion disk around the neutron star and the materials that compose it are slowly drawn towards it but a part can be ejected in jets perpendicular to the disk at a significant fraction of the speed of light. Jakob van den Eijnden of the University of Amsterdam and first author of the research explained that jets of that type were seen coming from all kinds of neutron stars that subtract materials to their companion except from the ones with a very strong magnetic field. The consequence is that according to current models, very strong magnetic fields prevent them from forming but his team discovered an exception. On October 3, 2017 NASA’s Swift Space Observatory detected an X-ray burst coming from an object that was cataloged as Swift J0243.6+6124 and for simplicity is called just Sw J0243. 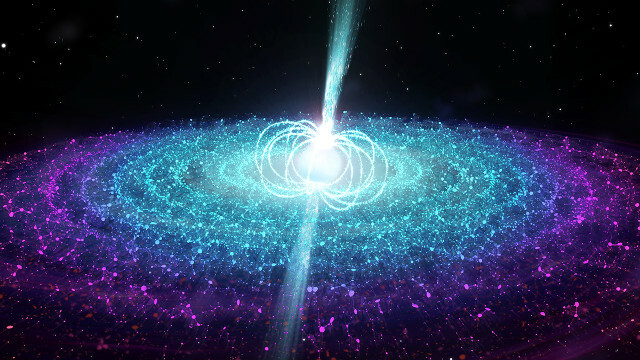 Initially it was indicated as a possible gamma-ray burst but follow-up observations showed continuous X-ray emissions and a periodicity of 9.86 seconds, which indicated its nature of a neutron star of the pulsar type, that is, emits pulses with regularity, in a binary system in which it steals materials from its companion. Further observations were conducted with NASA’s NuSTAR space telescope to monitor the X-ray emissions of the pulsar Sw J0243, which turned out to be a possible ultralumonous X-ray pulsar. Other observations conducted with the VLA radio telescope to monitor its radio emissions detected a source that was identified as a jet of material. This result, however, contrasts with the calculations of the this pulsar’s magnetic field, which turned out to be extremely strong, over 10^12 Gauss. Current models may be incomplete but there are two hypotheses to explain this apparent contradiction with them. It’s possible that the region of the accretion disk that launches the jet of material is farther than normal from the pulsar, in a region where the magnetic field is less intense and doesn’t prevent its formation. Another possibility is that the jets are powered by the pulsar’s rotation instead of being launched by the magnetic field lines of the inner accretion disk. Nathalie Degenaar, also of the University of Amsterdam and another author of the research, pointed out that the hypothesis of the jets powered by the pulsar’s rotation predicts that they’re much weaker than those of neutron stars with a slower rotation and that’s what astronomers are seeing. All this must be verified with further observations. Sw J0243 could be part of a group of objects with radio emissions too weak to be picked up by the VLA before the upgrade completed in 2012. Now it might be possible to find other similar ones to test the connection between jets and rotation. The discovery of objects with characteristics different from those predicted by our models can lead to new discoveries and improve our knowledge in ways that are sometimes unexpected. Sw J0243 was classified as a pulsar after detecting its regular emissions but it also has a very strong magnetic field, which is typical of neutron stars of the type called magnetar. There are various studies on the various types of neutron stars and their possible evolution therefore finding others similar to Sw J0243 could be really useful.